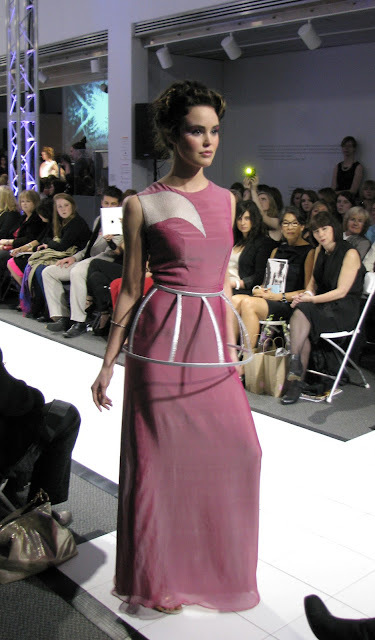 Last Thursday I attended Unbound, the annual fashion show held at Museum London, presented by the graduating students from the Fashion Design program at Fanshawe College. This is the third year I have been graciously allowed to photographed the show as "Media". 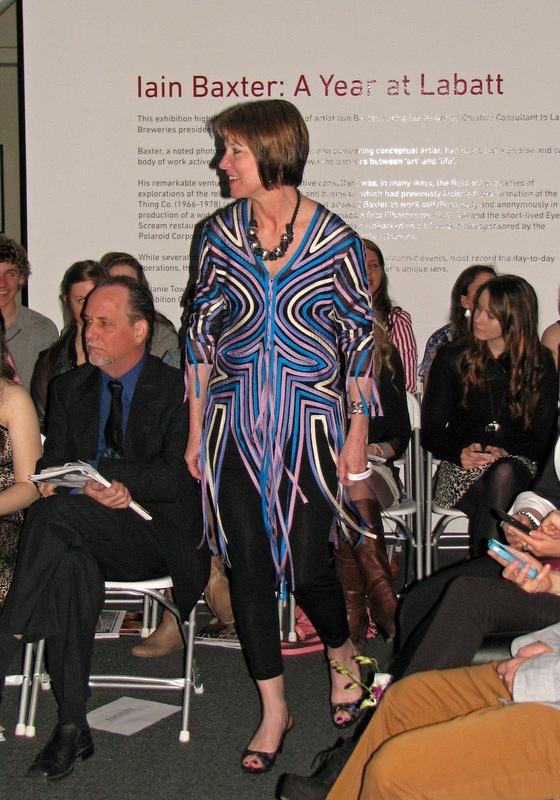 The Fashion Design program, which is highly respected in the fashion industry, celebrates its 40th Anniversary this year. I had just stepped in the door of Museum London, when I ran into a woman I know from one of our favourite stores, From Mars. She has modelled in a couple of their fashion shows and always looks great whenever I see her. Obviously, we have good taste as it turned out we were wearing the exact same dress that we had both purchased at From Mars. I have never been in this situation before, but instead of the mortification that apparently one is supposed to feel when confronted with another woman at an event who is wearing the same dress as you, I thought it was pretty cool - we accessorized the dress in our own way (me with arm warmers and a crinoline, she with awesome boots, a little jacket and neck scarf) and we got her husband to document the moment. 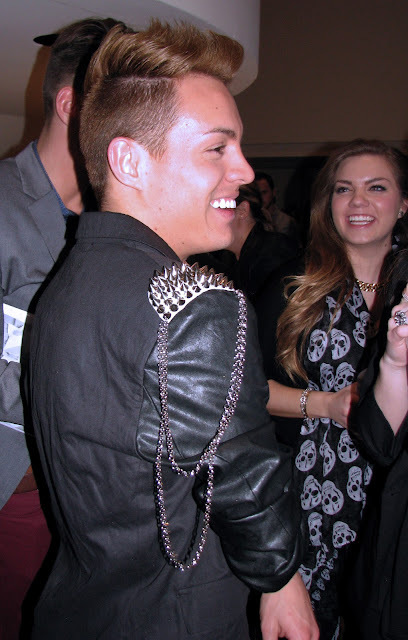 The Emcee of the show was Glen Baxter, host of CTV's In Fashion, seen here talking to the judges. 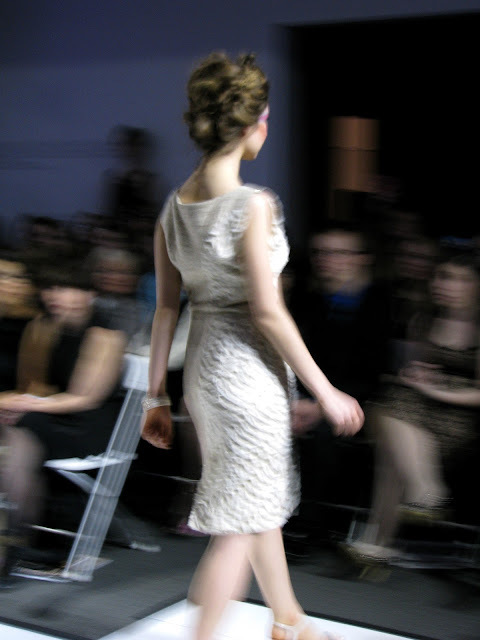 I took advantage of the time before the show started to shoot a few audience members whose style was runway-worthy. The woman in the photo above is the owner of Studio H, the official hair sponsor of the show. She rocked her disco-esque jumpsuit with a fab side ponytail. This is the second guy I've seen in London who has successfully incorporated orange pants into an outfit - they look great with the different shades of blue. 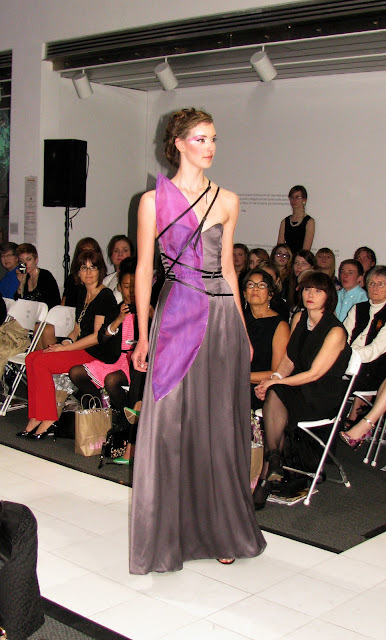 The evening lineup featured the designs from nine graduating students from the program. 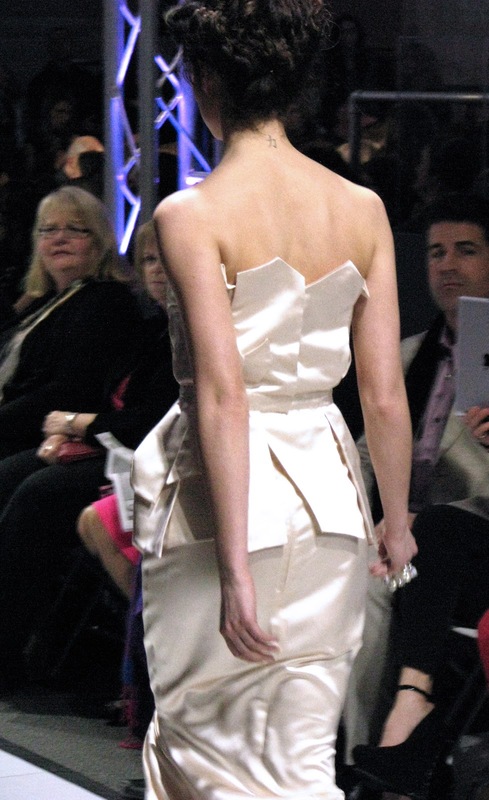 The students' work was reviewed by a panel of judges that included designer Franco Mirabelli and Erin O'Brien, the Marketing Editor at Flare Magazine. The collections featured both daywear and eveningwear, in fitted, feminine shapes, soft colours, and lots of shine in both fabric and embellishment. Overall, the clothing was very pretty and there were definitely echoes of the influence of shows like Mad Men, in the "lady-like" fitted, knee-length dresses. The elegant up-dos on the models and minimal jewellery kept the focus on the designs. First up was a collection of evening wear by Ashley Foster titled "Savage Flora" that featured the addition of petal shaped pieces of fabric on some of the dresses. 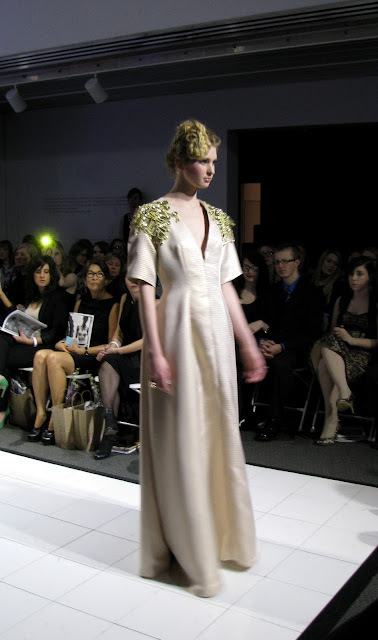 Julia Shore's collection, titled "Retrospect", included very feminine shapes with funky metal embellishments. The designer was inspired by a "west coast vibe with a rock and roll edge". 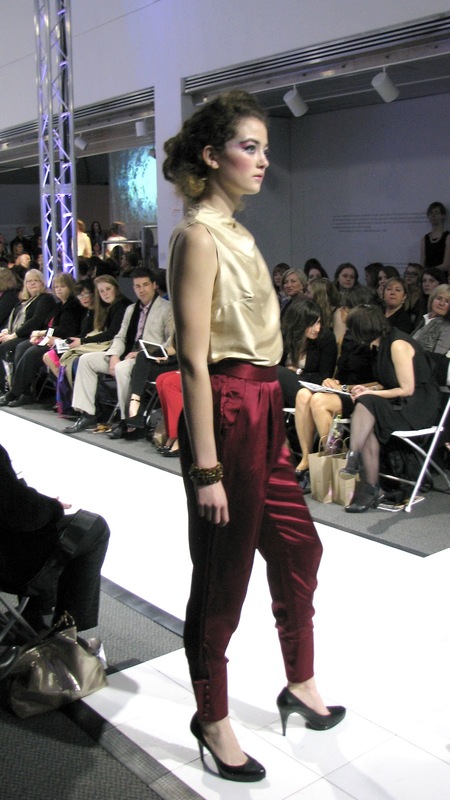 Another of Shore's designs was a pretty mix of soft ruffled blouse and tailored shorts with lace overlay. 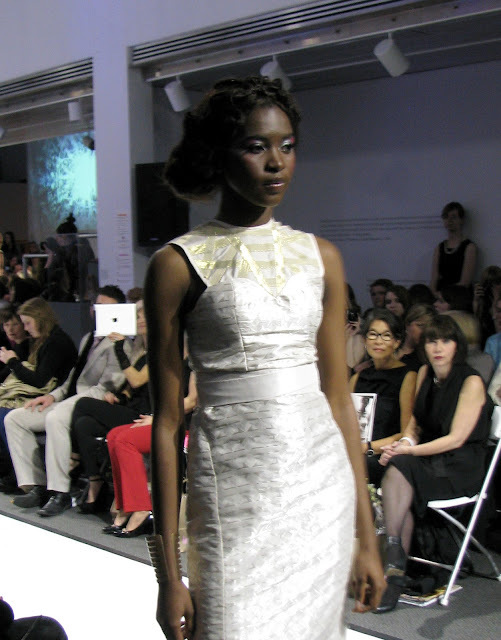 She was the only designer of the ones who showed in the evening that incorporated pattern into her collection. This fitted and elegant dress is part of Julia Cangemi's eveningwear collection. 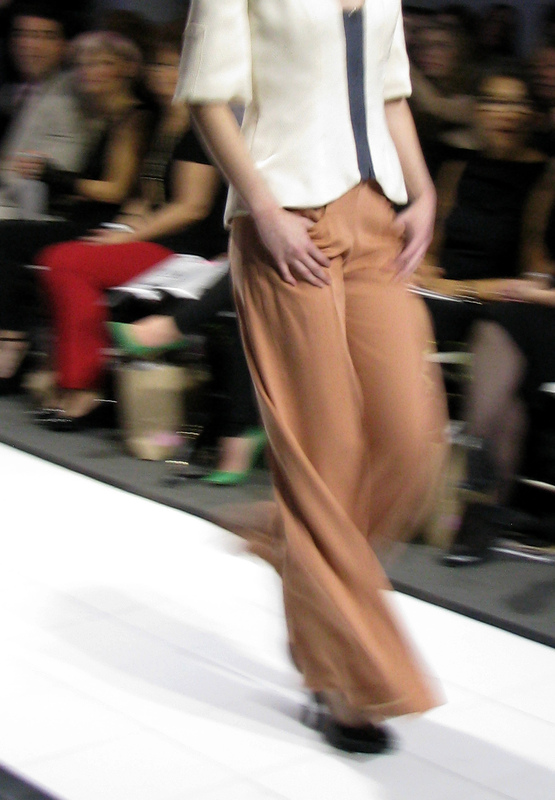 Cangemi was one of the three recipients of the Flare Award for Best Collection. On my way out I couldn't resist snapping a photo of the cupcake tower that had been set up for the post-show reception. I was able to resist the temptation to eat one. Congratulations to the award winners, and best of luck to all of this year's graduating students! I love how the same dress serves each stylish wearer so well. And gah! do I spy PLAID arm warmers. WANT. Great shots! My faves are your audience picks- loving how original everyone looks. What a cool night. I love all the pics of the people from the audience. Your plaid arm warmers are so cool and add sort of a punk edge to your look that I love. I think it's fun to see how the same dress is accessorized different ways. I would not have know you both had on the same dress since you both styled it in your own way. I am so impressed with these designs and can't imagine all the hard work that goes into this. Thanks for sharing! 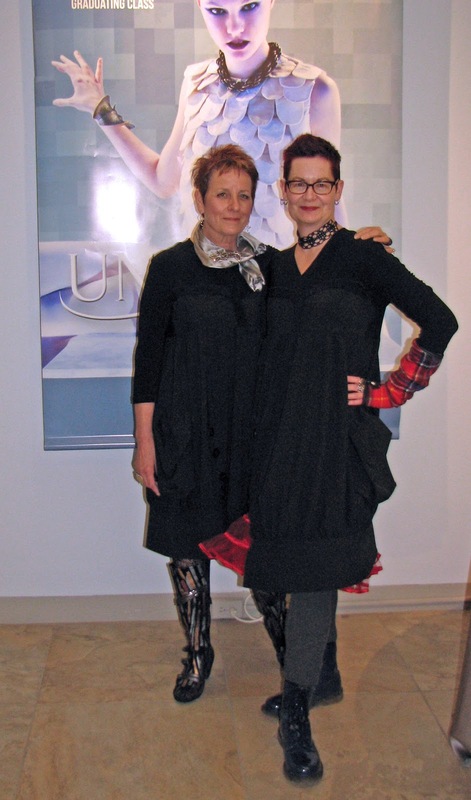 I love that you were wearing the same dress and both styled it in your own fabulous ways (LOVE your arm warmers!!). So much loveliness - the jellybean necklace is my FAVE! That sherbet dress is my favourite - just gorgeous. 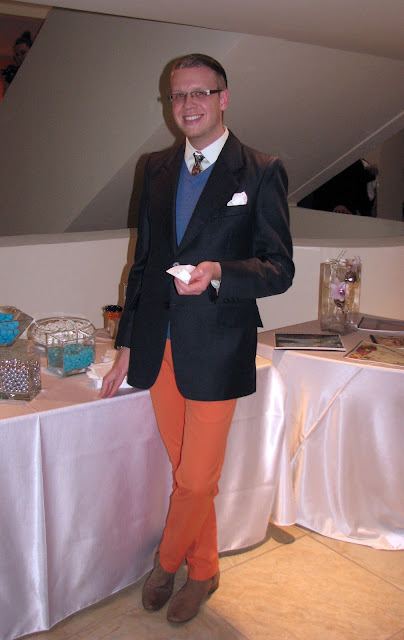 I love seeing orange pants on men - L and I just found him a pair of orange satin Versace trousers on consignment! I can't wait to help him style them. Blue is a great contrast. You look totally different in the same dress! Styling is all the difference! More excellent photography, Shelley. And some fabulous outfits, both the audience (including you and your dress twin) and on the runway. I'm sure there will be more "The Media" in your future. Beautiful photos of a fabulous evening, Shelley! How funny to meet someone with the same dress - but you have both styled it in your own ways, so it doesn't look like you are dress twins at all. I've never understood the horror of wearing the same outfit another woman has on. Whaaa? You both have great taste and look fantastic. You get to go All the Fun Things there. Your photos are great. I have never attended a fashion show, except an historical retrospective of little black dresses. 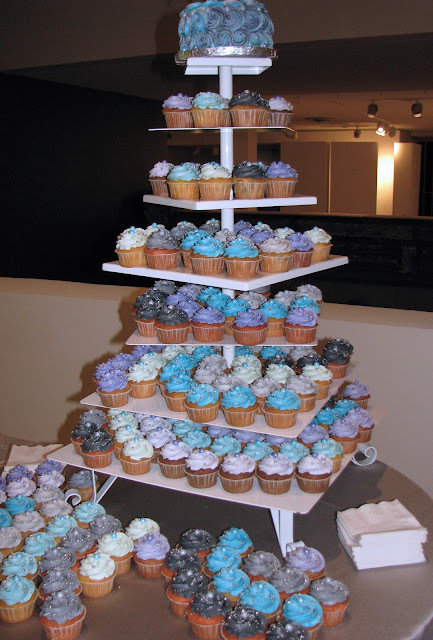 If I had gone to this you, you would have found me hoovering (uh, I mean hovering) around the cupcake tower.